Navigation in the costal waters in the northern Norway can be a demanding exercise, both due to topography and the variable climatic condition. Navigation skills and trust in own capabilities are therefore required. By being prepared and organized you will have a safe and pleasant journey under all conditions. Norwegian charts are of high quality and comprehensive to read. Most paper charts on board Boreal Yachtings fleet refers to WGS-84. Some exceptions for for charts produced before 1992. 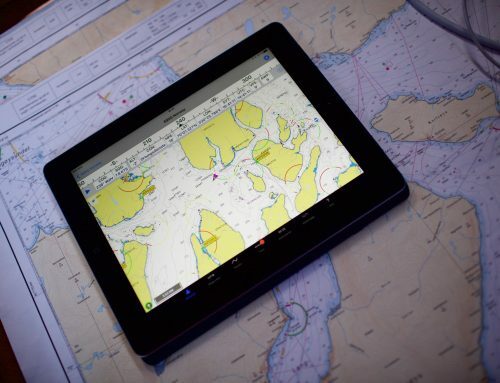 For more information regarding charts and datums, please follow the link to The Norwegian Mapping Authority. Tidal water and current are factors to consider for sail boats. The approximate difference between mean high and low water range from 2,0m to 2,7 m depending on the port. The range can under some conditions almost double. Please consult Tide Tables on board or download up to date information HERE. In the fjords of Norway tidal streams needs to be taken into consideration for sail boats. Generally the tidal stream is north going on flood and south-going on ebb. However, this is not always the case. Please consult Den Norsk Los for details for each area. Sailing with the stream always gives a better atmosphere on board than going against! *Places with significant tidal stream in northern Norway. Note that the tidal streams are not dangerous with 3 exceptions marked below. Always consult Boreal Yachting before entering into these waters. Wind conditions varies through the year. The roughest time for sailing is normally from October to January. The rest of the year, storms are rare and short lasting. The fjords of northern Norway offers alternative and protected routes which allow you to plan a comfortable journey, in any weather conditions. Due to the topography, steep mountains and the many fjords, fall winds (the phenomena Fall Wind is a wind that accelerates as it moves downslope from a mountain because of its low temperature and greater density) may hit on very short notice, even in a calm and sunny day. Often but not always, fall winds develops in easterly winds on the coast of Norway. These winds can be dangerous, the few second they last. Observe and try to avoid this situation. Most fjords and areas will always give you enough free water under the keel. However some areas will demand more attention. The charts are marked with the safe waterways (Farled). Pay attention to these navigation marks and follow them! All yachts have up-to date navigation equipments. Please make yourself familiar with charts, pilot books, chart-plotter, radar and other equipment before the trip starts. An electronic copy of the Norwegian Cruising Guide can be downloaded at a very favourable price. With these simple advices, we hope that you will have a safe and comfortable journey. More details are in the pilot books available on board in all boats. And please do not hesitate to contact us!